As described in Scripting usage, batch scripts carry out sequences of program actions in a non-interactive manner and are typically executed from the terminal using the ovitos script interpreter. The following examples demonstrate how this can be used to automate various tasks and accomplish new things that cannot even be done with the graphical program version. This script demonstrates the use of the Voronoi analysis modifier. The script calculates the distribution of Voronoi coordination polyhedra in an amorphous structure. A Voronoi polyhedron is expressed in terms of the Schlaefli notation, which is a vector of indices (n1, n2, n3, n4, n5, n6, …), where ni is the number of polyhedron faces with i edges/vertices. 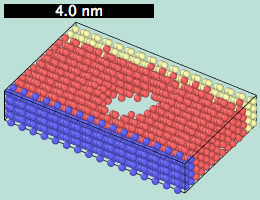 # Load a simulation snapshot of a Cu-Zr metallic glass. # Set atomic radii (required for polydisperse Voronoi tessellation). # Set up the Voronoi analysis modifier. # Let OVITO compute the results. # Access computed Voronoi indices. # This is an (N) x (M) array, where M is the maximum face order. # histogram of the data rows using some NumPy magic. # Print the ten most frequent histogram entries. The following script demonstrates how to use the CreateBondsModifier to create bonds between particles. The structural environment of each created bond is then characterized with the help of the CommonNeighborAnalysisModifier, which computes a triplet of indices for each bond from the topology of the surrounding bond network. The script accesses the computed CNA bond indices in the output DataCollection of the modification pipeline and exports them to a text file. The script enumerates the bonds of each particle using the BondsEnumerator helper class. # Import standard Python and NumPy modules. # Load the simulation dataset to be analyzed. # Compute CNA indices on the basis of the created bonds. # Let OVITO's data pipeline do the heavy work. # containing the three CNA indices computed for each bond in the system. # Loop over particles and print their CNA indices. # Print particle index (1-based). # Create local list with CNA indices of the bonds of the current particle. # Count how often each type of CNA triplet occurred. # Print list of triplets with their respective counts. 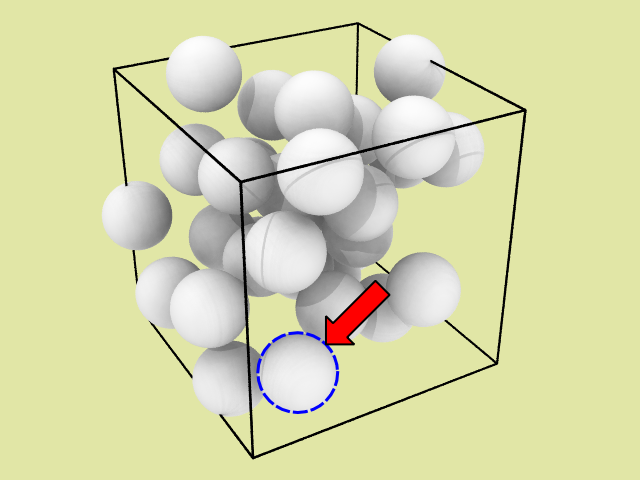 The following script demonstrates the creation of particles, a simulation cell, and bonds on the fly without loading them from an external simulation file. This approach can be used to implement custom data importers or dynamically generate atomic structures within OVITO, which can then be further processed or exported to a file. The script creates different data objects and adds them to a new DataCollection. Finally, a Pipeline is created and a StaticSource object is used to make the DataCollection its data source. OVITO allows you to implement your own type of analysis modifier by writing a Python function that gets called every time the data pipeline is evaluated. This user-defined function has access to the positions and other properties of particles and can output information and results as new properties or global attributes. When used within the graphical program, the MSD value computed by this custom modifier may be exported to a text file as a function of simulation time using OVITO’s standard file export feature (Select Table of Values as output format). # Load input data and create a data pipeline. # Insert user-defined modifier function into the data pipeline. In the paper [Phys. Rev. Lett. 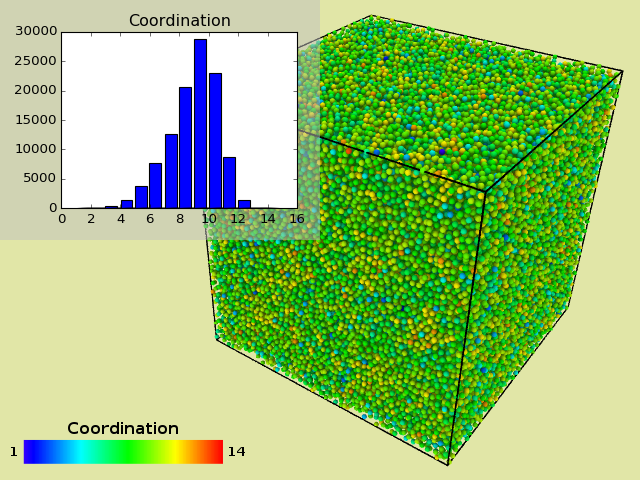 86, 5530] an order parameter is specified as a means of labeling an atom in the simulation as belonging to either the liquid or solid fcc crystal phase. In the following we will develop a custom analysis modifier for OVITO, which calculates this per-atom order parameter. The order parameter is defined as follows (see the paper for details): For any of the 12 nearest neighbors of a given atom one can compute the distance the neighbor makes from the ideal fcc positions of the crystal in the given orientation (denoted by vector rfcc). The sum of the distances over the 12 neighbors, phi = 1/12*sum(| ri - rfcc |), acts as an “order parameter” for the central atom. Calculating this parameter involves finding the 12 nearest neighbors of each atom and, for each of these neighbors, determining the closest ideal lattice vector. To find the neighbors, OVITO provides the NearestNeighborFinder utility class. It directly provides the vectors from the central atom to its nearest neighbors. # Rescale ideal lattice vectors with lattice constant. The actual modifier function needs to create an output particle property, which will store the calculated order parameter of each atom. Two nested loops run over all input atoms and their 12 nearest neighbors respectively. # Create output particle property. # Request write access to the output property array. # Loop over all particles. # Loop over neighbors of current atom. # Sum up the contribution from the best-matching vector. # Store result in output array. Note that the yield statements in the modifier function above are only needed to support progress feedback in the graphical version of OVITO and to give the pipeline system the possibility to interrupt the long-running calculation when needed. The Polyhedredral Template Matching (PTM) function of OVITO allows computing the local lattice orientation for each atom in a (poly)crystal. The computed local orientations are stored by the modifier as quaternions, i.e. as rotations within the fundamental zone, in the particle property named Orientation. Each per-particle quaternion can be translated into an RGB color to visualize the local lattice orientation. This can be achieved by inserting a custom Python modifier into the pipeline which translates the output of the PTM modifier into RGB values and stores them in the Color particle property. corresponding RGB colors (Nx3 array) """
# could be computed by the PTM modifier.
""" The user-defined modifier function """
This example shows how to write a user-defined modifier function that searches for pairs of particles whose distance of separation is within the specified cutoff distance. Then one of the two particles in the pair is selected by the modifier. Subsequently, the user may apply the DeleteSelectedModifier to remove these selected particles from the system and eliminate any potential overlaps among particles. The modifier function below makes use of the CutoffNeighborFinder utility class, which allows finding neighboring particles that are within a certain range of a central particles. The modifier produces the standard output particle property Selection. # Update progress display in the status bar. # always select only one of the particles in a close pair. OVITO allows you to implement your type of viewport overlay by writing a Python function that gets called every time a viewport image is being rendered. The following script renders a scale bar into the viewport (with a fixed length of 4 nm, as shown in the example picture). You can copy/paste the source code into the script input field and adjust the parameters in the code as needed. # This function is called by OVITO on every viewport update. Ths user-defined viewport overlay function demonstrates how to use the Matplotlib Python module to render the radial distribution function, which is dynamically computed by a CoordinationAnalysisModifier in the data pipeline, on top the three-dimensional visualization. matplotlib.use('Agg') # Activate 'agg' backend for off-screen plotting. # Render figure to an in-memory buffer. # Get output data collection of first scene pipeline. # Project center point of particle. # Determine display radius of the particle. # Calculate screen-space size of the particle in pixels. # Draw a dashed circle around the particle. # Draw an arrow pointing at the particle. © Copyright 2019, Alexander Stukowski.